The GDP of the US grew by 2.32% in the 2nd quarter of 2015, weakened from 2.88% in the same quarter of the previous year. The US economy is affected from the strong dollar, but the number is still strong enough to justify the Fed’s rate hike in Sep. If we see the details, investment and exports are weak as expected, but the slowdown of imports is a bit of surprise. 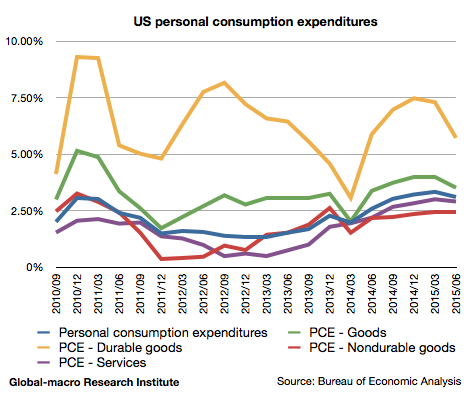 Personal consumption is weakened, too, which indicates with imports the weak demands within the country. Personal consumption grew by 3.10%, weakened from 3.32% in the previous quarter. It was lead by non-durable goods, whilst durable goods and services were relatively okay. This corresponds to the fact that NASDAQ has recently outperformed S&P 500. The stock price of Netflix (NASDAQ:NFLX; Google Finance) has been doubled since Jan. The technology industry, represented by Silicon Valley, seems growing well. On the other hand, the effect of the lowered petrol price doesn’t appear in the numbers. We may think of a couple of reasons for it. First, the households might be saving money or paying debts taking advantage of the lower petrol price. American citizens tend to delay the payments for their credit cards, and therefore when they earn some extra money, a part of it disappears into the private debts. The second assumption, which we believe more, is that the higher rents are affecting the consumption. The house prices in the US currently grow by around 5% per year, and so the higher rents should be restricting their financial activities. Yet, this negative trend could be weakened when the Fed raises the interest rate, which would pressure the house prices. 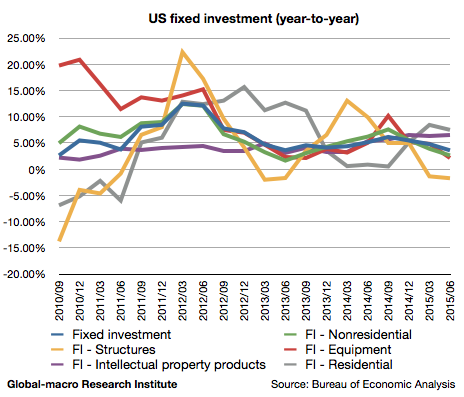 The growth of fixed investment significantly decreased to 3.58% from 4.77% in the previous quarter. The only element that increased its growth was intellectual property products, which also indicate the growth in the technology sector. Fixed investment is significantly affected by the slowdown of investment by energy-related firms, which wouldn’t surprise investors. 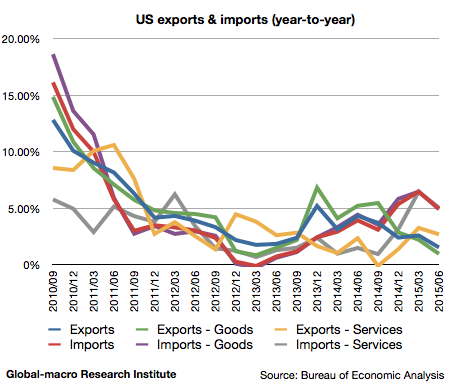 Imports slowed down as well as exports. Exports grew by 1.53%, compared to 2.59% in the previous quarter, and imports grew by 4.94%, compared to 6.46% in the previous quarter. The slowdown of imports was a surprise. As the strong dollar pressured import prices, imports would look stronger if we see it in quantity rather than revenue, but this isn’t also a result that indicates a strong economy. The slowdown of exports were expected, as the earnings of exporters have already disappointed the markets. In the situation where no country in the world grows brilliantly, the US economy alone couldn’t support all the other weak economies. As the currency war prevails, it wouldn’t be so long until the US economy gets dragged into a low growth. However, the slowdown of the US economy might please the Fed. The growth of 2.32% is still enough to justify their rate hike in Sep. Nevertheless, considering the trend, the GDP for the 3rd quarter might disappoint further, so if the Fed is seeking an excuse to raise the interest rate, they might be hurried and might not be waiting until Dec. Nevertheless, the strong GDP is still necessary for a rate hike to convince the financial markets, but they would naturally care much more about the possibility of a market crash than the mere slowdown of the economy. Dr Yellen must be relieved by the results. 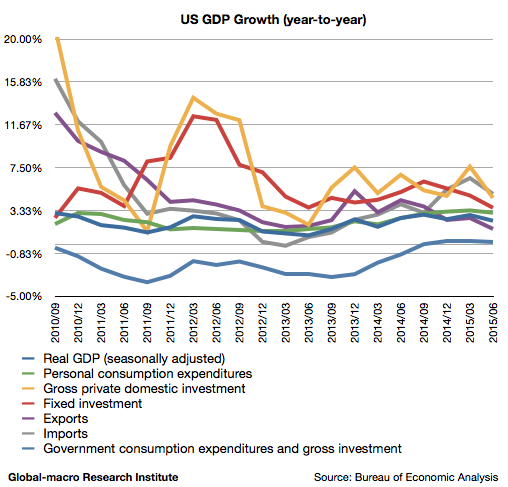 The US economy is currently subject to several different trends. The strong dollar weakens exports, cheap petrol doesn’t quite promote consumption, and the fuelled house prices are increasing the rents and affecting the households. The Fed would be eager to raise the interest rate soon, but we assume the second rate hike could be significantly delayed. It’s obvious that the world’s economy is slowing down, and consequently the interest rates would be kept low worldwide even after the first rate hike. This will extend the QE bubble in the world, and the destined market crash will be postponed. The European property stocks have some more room to boost. We’re in a peculiar situation where the markets rejoice when the economies slow down, but it can’t last forever. The investors, therefore, need to be prepared. Previous PostWhen to buy gold in 2015/2016: Gold is a way to avoid the market crash in the near futureNext Post2015-2016: What will happen to USD/JPY when the BoJ expands the QE further?